The baby was sleeping during my last ultrasound, so Matt said I should drink a smoothie before this appointment to wake it up. Well it looked like he or she was doing gymnastics in the womb. It was moving around so much that we were unable to get any still pictures. Thanks, Matt! 🙂 It was fun to watch the baby flip around, though. The tech said the heart rate should be leveled off by this point in the pregnancy. It was 171. Our last heart rate was 174, so it seems to be consistently high. A week and a half after that appointment, I started spotting and having cramps on a Thursday afternoon. I was incredibly nervous. Bright red blood is a scary sight when your baby is growing inside of you. I called the doctor’s office, but, of course, he was out of town. The nurse told me I could come in the following morning for blood work to make sure my hcg and progesterone levels hadn’t dropped. Their office closes at 1p.m. on Fridays, so I had to wait on pins and needles until Monday for results. All I could do was stay off of my feet all weekend and pray that everything was ok. I was a nervous wreck. I tried to remind myself that stress isn’t good for the baby. When Monday morning finally came around, the nurse said the blood work looked “beautiful” but the doctor still wanted to do a cervical exam to be overly cautious. After a thorough exam, the doctor assured me that everything was “better than great” with my sweet little bambino. He then remarked that he could still see worry and fear on my face. 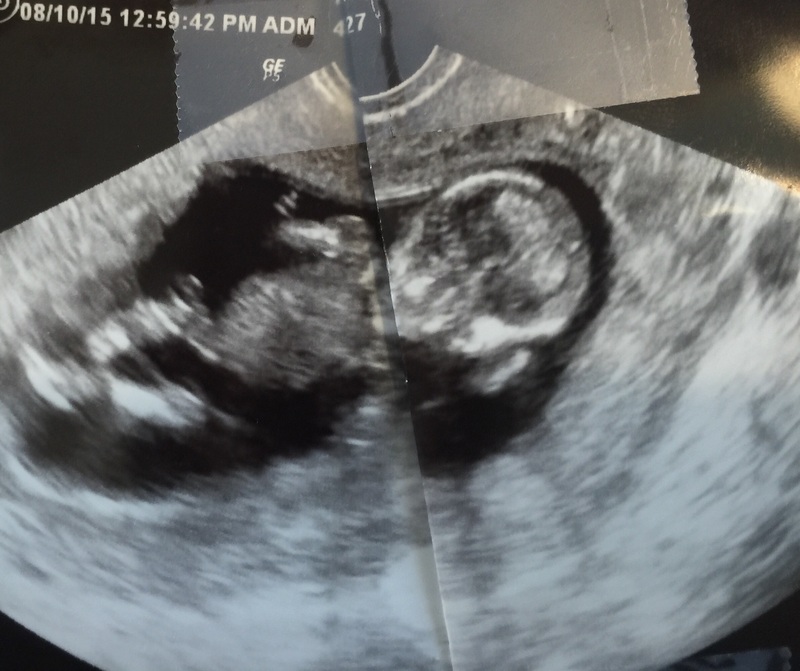 He said he wasn’t satisfied until I felt at ease, so he was going to send me for an ultrasound just to reassure me. Have I mentioned how much I love my doctor? THAT is the kind of prenatal care women need. It’s remarkable to see how big this baby is getting. Just 4 weeks ago, he or she only took up a tiny little portion of the sac. I am so thankful that I have had so many ultrasounds. I love watching this miraculous process unfold. The morning (make that all day) sickness is still wreaking havoc. I haven’t had a break from it yet. The Diclegis and Phenergan help a little bit some days, but they don’t help at all other days. It is just something I have learned to live with. 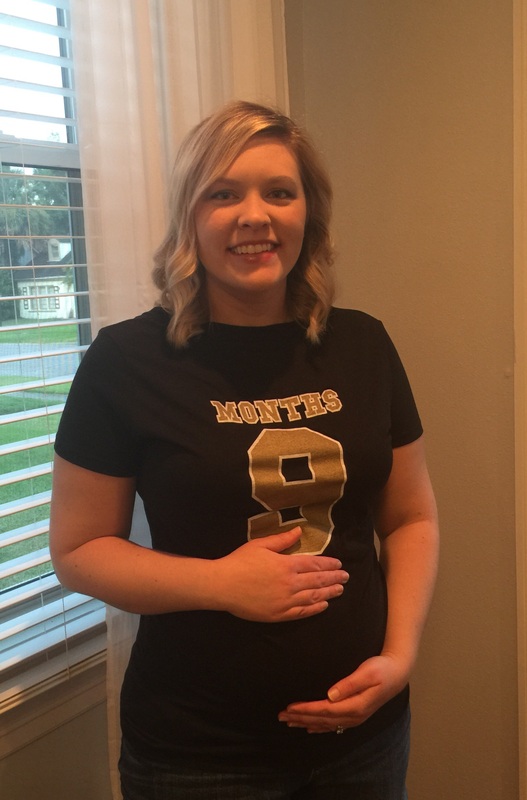 The doctor said it should have been gone by now and that “the baby didn’t read the textbook.” He said it might go away soon or I might be that rare 1% of women who throw up every day until delivery. Let’s hope that’s not the case. Things have been pretty crazy around here. We are remodeling our upstairs and trying to get everything in working order for the baby. I know things will only get more hectic as the due date nears. I have to keep reminding myself to slow down and put my feet up from time to time. It’s hard to remember that it’s more important to rest than worry about everything being perfect. I am a Type A personality, and I like to keep my house in tip top shape. That has been very difficult with all of the sickness and fatigue lately. I guess this is conditioning me for life with a newborn when I will have no time to clean anything anyway or life with a toddler whose toys are scattered all around the house. My cousin’s son left for college today and she told me, “It goes by so fast. Don’t spend it all cleaning.” That really hit home with me and I thought it was great advice. My hormones and emotions have been really out of whack the past few weeks. I will hear a song on the radio or see a touching commercial and start crying uncontrollably. Sometimes I cry for no reason at all. I know this is all just part of pregnancy and I am doing my best to enjoy the wild ride. My belly really started to pop out last week. I’m not sure where it came from, but it is definitely there. Hello! I recently received a bunch of messages from concerned friends wondering why I haven’t posted anything in a while. This made me realize I better check in with y’all. The truth of the matter is that I just haven’t had anything interesting to report. Since the specialist released me, I no longer have weekly checkups. I am now being treated every few weeks by a regular OBGYN, and the visits are rather uneventful. Sometimes it feels strange to be in a waiting room full of pregnant women who have no idea what it took to conceive this baby. It is a very different environment than that of the fertility clinic. I hear a lot of complaining and a lot of people taking their gift for granted. I recently overheard a patient lamenting that she needed a drink because she had been pregnant for “3 years straight.” I still have moments where I want to lash out at people and tell them how lucky they are that this all comes so easily. I think of my friends who are still struggling to conceive ONE child (many of whom have been trying for much longer than I had to). I have to remind myself, though, that if I hadn’t gone through all of this I would probably be one of those people too. Let’s face it, pregnancy is no cake walk. I’ve had morning sickness every single day so far and I have yet to eat a full meal. That can certainly take a toll on you after a while. Believe it or not, it makes me thankful for my struggle. The battle makes the victory that much sweeter. Every time I think that I can’t feel any worse, I remind myself how low I felt when I had to entertain the possibility that we may never have a child. Recalling those emotions, I remember that there are MUCH WORSE feelings than extreme nausea. I am also constantly reminded how lucky I am as several people I know have recently endured miscarriages. The fact that my pregnancy has been “uneventful” is as big of a blessing as the miracle growing inside of me. After reviewing my hormone levels, my new OBGYN told me that the clear reason for my nausea is simply “such a healthy baby.” Wow. My stomach might be empty, but my heart sure is full. I hope and pray that every woman struggling with infertility gets the chance to experience this feeling. It’s great to be so sick because your baby is so healthy. I thank God every day that I am 10 weeks pregnant with this beautiful little miracle. Good morning! I hope everyone had a wonderful 4th of July. 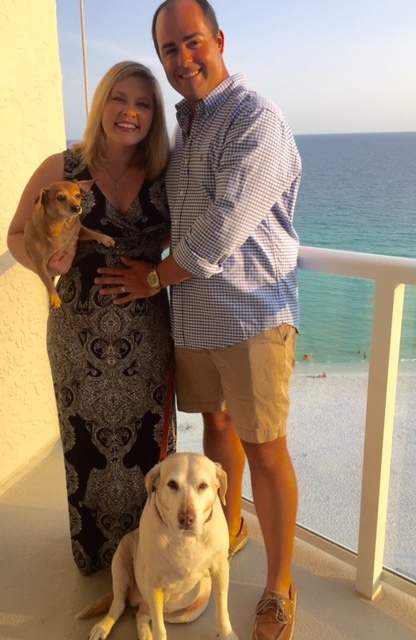 We spent our 4th of July on vacation in Destin, FL. As I mentioned in my previous post, I spent our last Destin vacation (in 2013) in the hospital with a ruptured ovarian cyst. Unfortunately, I had a little scare and had to return to the same hospital this time. Our first morning there, my husband and my mom went out deep sea fishing. I stayed at the condo to rest because deep sea fishing isn’t safe for pregnant women and it isn’t my thing anyway. They left around 4a.m. A few hours later, I woke up in the most horrible discomfort I have ever experienced in my life. I knew something was wrong. I went to the bathroom and the pain intensified. I looked in the toilet and noticed a pretty sizable amount of blood. You NEVER want to see blood when you’re pregnant. With my mom and hubby offshore and out of cell phone reception, I had no choice but to drive myself to the hospital. When I arrived, the nurse gave me a cup to provide a urine specimen in. I filled the cup and noticed it was full of blood. I started to panic, thinking that there was a good chance I was having a miscarriage and I was all alone. The doctor came in to see me and ask a few questions about my history and the pregnancy. Then he left to test the urine. Thankfully, it turned out that I had hemorrhagic cystitis, which is basically such a bad UTI that you get little blood clots in your bladder that rupture when you go to the bathroom. The doctor said this is somewhat common in early pregnancy. When the uterus grows so quickly, it can block off the urethra making it impossible to properly eliminate all of the urine. Phew! I felt a little better, but I was still worried about the baby. 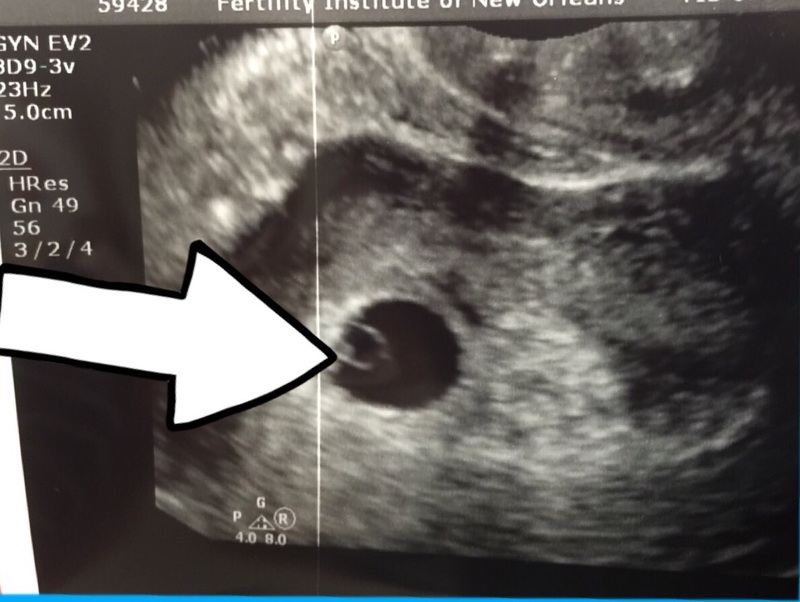 I begged and begged for an ultrasound but was met with an emphatic “NO!” The doctor said it was very clear that I had hemorrhagic cystitis and there was no reason to check the baby. I tried to explain that this baby was my little miracle baby who was conceived after a very long struggle with infertility. I told him it would alleviate all of my stress and fear if I could just see that little heart flickering on the screen. He not only refused but asked if I was questioning his authority that the baby was OK. He left the room in a huff and returned moments later with 2 pills. He put the pills in my hand with a glass of water and instructed me to swallow them and sign my discharge papers. I asked him what pregnancy class these pills were in. He told me that he wasn’t sure. I asked if he could look it up. He said no and asked why I came to the hospital if I didn’t trust him to treat me. I started to feel both upset and enraged that this doctor was treating me so poorly at such a stressful time. I told him that I would not swallow the pills or sign the discharge papers until I spoke to my doctor and that if my doctor thought I needed an ultrasound I would not move out of the bed until they gave me one. He looked surprised. He was definitely a pompous idiot, and I got the impression that he isn’t used to patients standing up to him. Mama Hen does not play. I called my doctor’s office and got the on-call doctor. I told him all of my symptoms and before I could get the diagnosis out of my mouth, he said it was hemorrhagic cystitis. That made me feel SO much better. He calmed me down and explained the condition in a very patient manner, assuring me that this would not affect the baby. He told me that both medications the doctor prescribed were very safe to take. 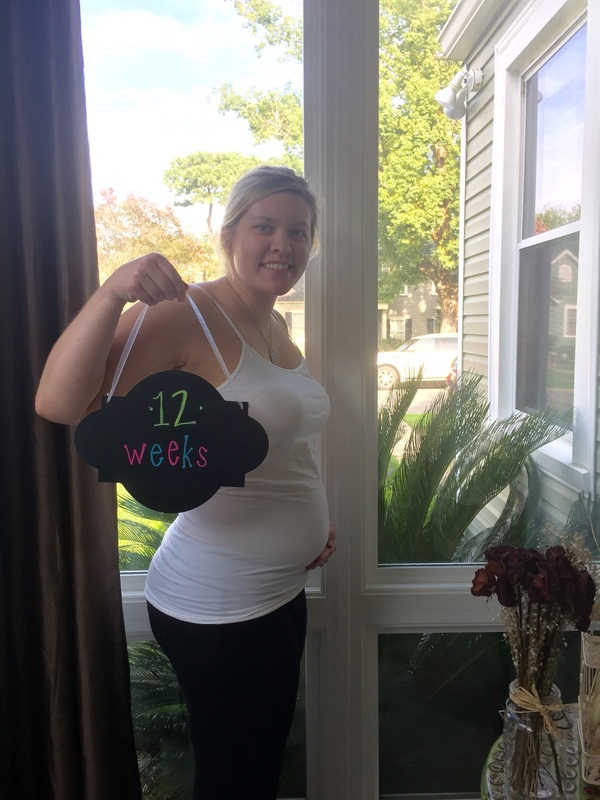 He also said that while he didn’t think an ultrasound was absolutely necessary, he was shocked that any doctor wouldn’t order one to ease an expectant mother’s worries. Thank you! I hung up the phone in a much calmer state of mind, swallowed the pills and signed the discharge papers. The medicine made me feel pretty awful for the rest of the vacation and fear kept creeping into the back of my mind that this was somehow affecting the baby. I tried to enjoy myself as much as possible given the circumstances. My doctor promised to do an ultrasound as soon as I returned home. The 5 days in between passed very slowly. Yesterday my ultrasound appointment was scheduled for 9:15. I showed up at 8:15 praying they would call me back early. I felt so anxious. I just had to see that little heart beating. As soon as I signed in, they called me back. I stared at the screen and the tears started flowing when I finally saw that little heart beating stronger than ever. The ultrasound tech didn’t even need to point it out this time. It was clear as day. My heart felt so full! Our little angel baby…a beautiful sight! 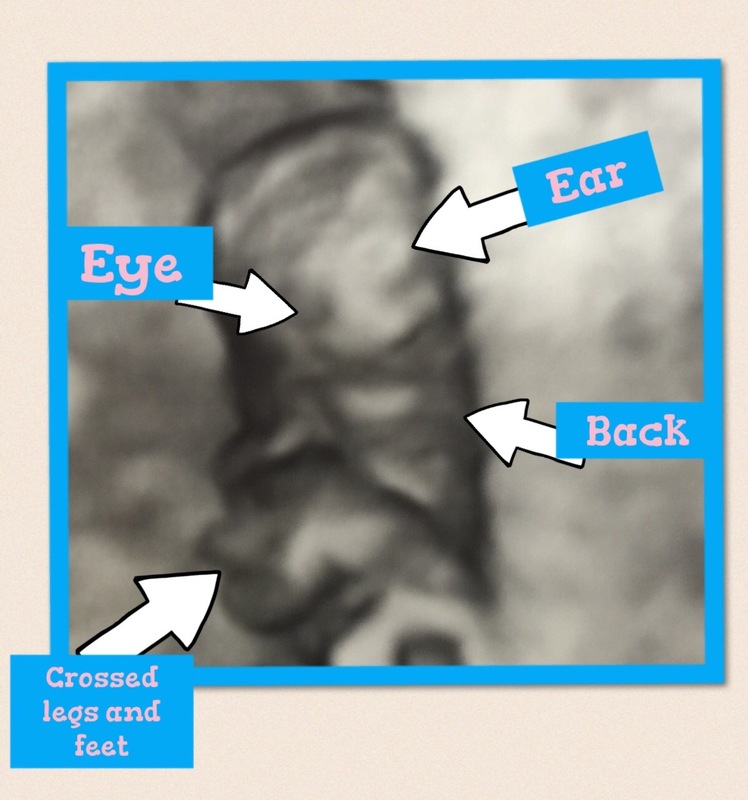 She was also able to point out the formation of the pre-brain, the spine and the little arm buds and leg buds. The baby was incredibly active, flip flopping all over the place and the heart rate was 159. I’ve never seen a more beautiful sight. I think it was the first time I really experienced that surreal feeling that someone is actually living inside of me. Now we are headed off to Destin, Florida to celebrate the holiday weekend. Last time we went to Destin was July of 2013. During the vacation, I had to visit the hospital there, because a cyst the size of a golf ball ruptured on my ovary while I was laying on the beach. I was devastated. Not only was I upset that I missed out on the entire vacation. It was a stark realization that my endometriosis was getting so much worse, and I honestly wondered if we would ever be able to have a baby. I felt so hopeless at that time. 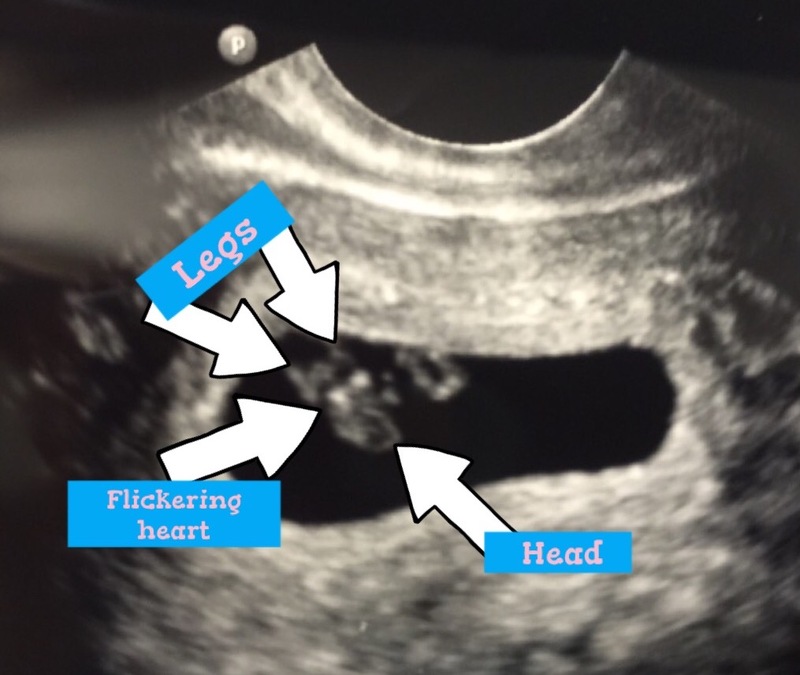 How serendipitous to see our child’s heartbeat for the first time on the day of our return trip. It just goes to show you that you can never count yourself out. No matter how hopeless your situation seems, things can always turn around. Even miracles take a little time. Have a wonderful 4th of July, y’all. God Bless America! Happy Friday, friends! I had to make another trip to the doctor today. The pain I had earlier in the week got 10 times worse yesterday. I didn’t even want to walk around or stand up. When I woke up this morning it was much better, but my doctor wanted to see me anyway. I feel incredibly lucky to have such a proactive and overly cautious doctor taking care of me. After a very thorough ultrasound, he determined that everything looked great except my right ovary. I still have several cysts on it. My right ovary has been the bane of my existence for as long as I can recall. You might remember that the constant ginormous cysts it produces resulted in cancellation of two of my earlier cycles. I thought that once I got pregnant it would calm down, but apparently it’s still fighting the good fight. You almost have to admire its tenacity. The good news is that while these cysts are causing a lot of pain, they are not dangerous and will not affect the baby. That’s all that matters to me! My doctor asked me to take it easy for the rest of the weekend and stay off of my feet as much as I can. 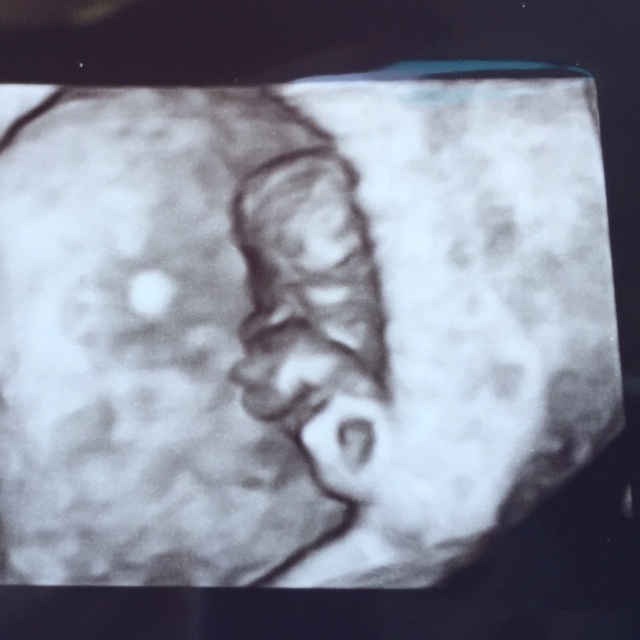 The best part about my appointment today, though, was that I got my very first glimpse of the baby!!! The big circle you see is the gestational sac, which is filled with amniotic fluid and will be the baby’s home until he or she makes their debut. The smaller circle inside of the big circle (on the left hand side) is the yolk sac. The yolk sac supplies nutrients to the baby in early pregnancy. Then if you can see that object that looks like a tiny grain of rice and stretches from inside the bottom half of the yolk sac down to the bottom of the gestational sac, THAT is our baby! I know it’s really small. You’re probably squinting and still can’t see what I’m talking about. But it’s there. That’s my sweet little angel. It’s hard to believe that within the next 34 weeks that tiny little grain of rice will develop and grow into a fully functioning human being. Until then, I will do everything in my power to nourish and protect that little baby and give it everything it needs to prosper. 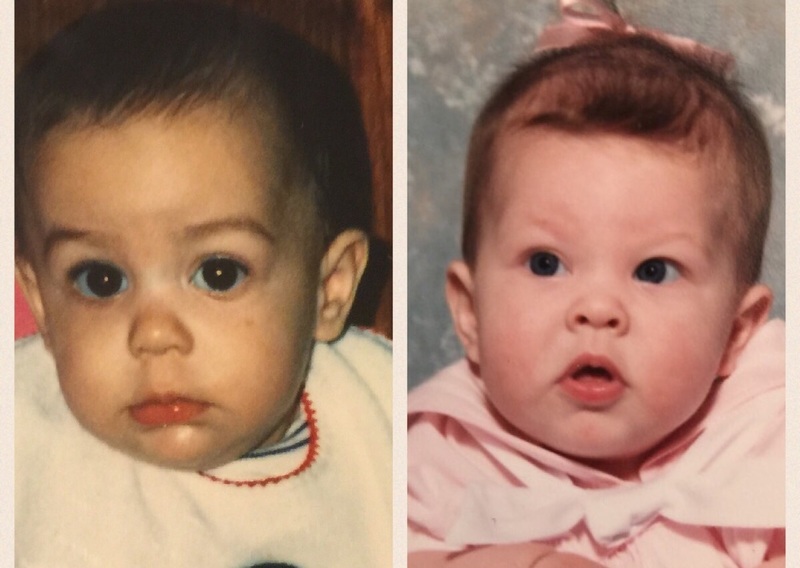 Now the real question is…who does Baby P look like? Mom or Dad?